The Philips SpeechAir fits perfectly into your daily workflow. Record your voice on the mobile cloud app from your office or on the road and securely send it off for transcription. You can send your recordings to your assistant or use the Philips SpeechLive transcription service, where trained professionals will quickly type up your documents for you. You can also use speech recognition for almost instant transcription results. 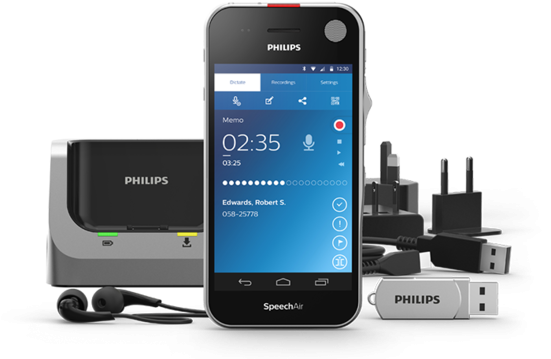 The new Philips SpeechAir now comes with the latest Philips SpeechLive cloud dictation solution including 100 speech recognition minutes free on top. The offer is limited to the first 40 SpeechAir orders. Philips SpeechLive makes going from your voice to a written document quicker and more convenient than ever before. No matter where you are, whether in your office or on site, you can record your notes, task lists or documents, and send them to SpeechLive for immediate transcription. You can be productive on the go and have your recordings professionally transcribed, even if you do not have an in-house transcriptionist. If your firm is moving your IT infrastructure to the cloud why not go the whole hog and move your dictation solution to the cloud as well with SpeechLive and the Philips SpeechAir WiFi recorders. Get more information and download the Philips SpeechLive brochure. Always stay connectedWi-Fi, LAN, USB and Bluetooth. Save time by transferring your finished recordings wirelessly to your transcription staff and directly accessing your clients' data in your document management system.Use Wi-Fi for VoIP calls and accessing your emails and calendar. Add flexibility by connecting a Bluetooth headset or speakers. The integrated recorder app comes with professional dictation features such as editing modes, priority and EOL flag, enhanced data and dictation list as well as sending options (to network folder, Philips SpeechLive Voice Recognition services or email recipients).The Hardware SDK allows you to integrate your device into your own workflow solution, for example connect your SpeechAir to your hospital (or Legal) information system (HIS) to access patient (client) data directly. Remotely configure the device in real time and lock the settings for advanced security. Get informed and download the Philips SpeechAir brochure.